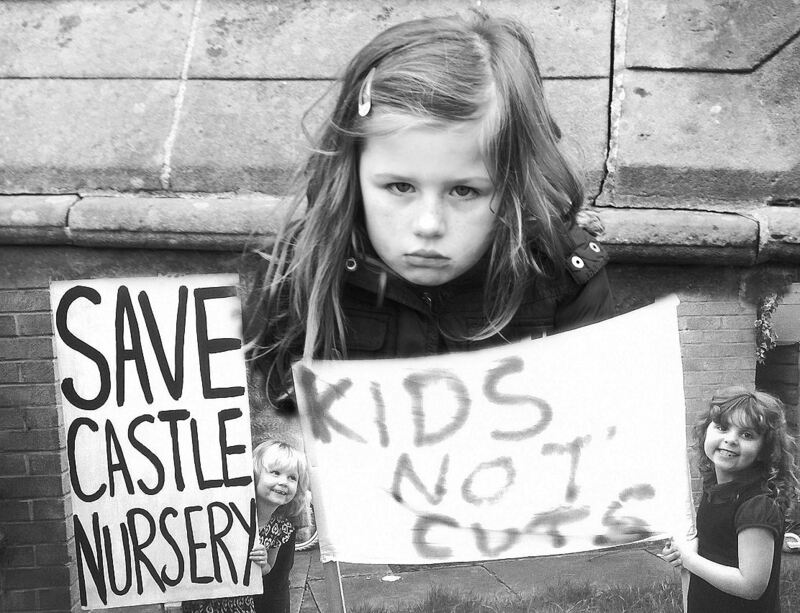 Derby City Council has decided to close the Castle Nursery in order to re-allocate £100,000 ( of a £195 million budget) and deprive the children of Derby of an Outstanding Nursery in the City Centre. The reason given is solely high cost/pupil resulting from low occupancy. It has a higher than average level of children with Special Educational Needs. The current low usage results from the poor efforts of the Council and the Governors in making it visible. The relatively high cost/pupil results from this and Council imposed capacity restrictions. The people losing out are the children, parents, and the staff – all of whom will soon be made redundant ; none of whom have a responsibility for occupancy levels. The school is in the middle of the major new Castle Ward housing development which requires a Nursery to be in place – the developer’s preferred option is to re-locate Castle Nursery and its staff. The Consultation has been cursory; the feedback was 100% against closure, and the Council has completely ignored the views of the respondents. There has been little useful engagement with the recently formed Friends of the Castle Nursery (FCN) parent group – in fact people have been advised not to communicate with them. The Council has not examined any alternative proposals. The Council do not have an up to date survey of available places across the City; the last one indicated a gap in provision. This will be made worse by the recent Government announcements to double the funded weekly hours. Despite the fact that FCN have identified interest which would nearly double the occupancy, the Council still refuse to discuss it. They are single-minded in their objective of closing the Nursery regardless of how shallow their process has been, and how ridiculous the conclusions are. It is questionable whether they have complied with Department of Education guidelines and a judicial review will assess this. The Council need to do what they espouse – listen to the people, listen to common sense, work hard together, and keep Castle Nursery open. “This is an outstanding school. It is outstanding because it is highly successful in meeting children’s wide range of learning needs through providing high-quality teaching and support tailored to suit each individual child. Disabled children and those with special educational needs are fully included in all activities and make excellent progress. Extracts from the latest OFSTED report on Castle Nursery, based in the centre of Derby. This is the Nursery that the Derby City Council (DCC) is in the process of closing on 31 August 2015, just to “save” £100,000. Castle Nursery is 1 of 8 maintained nurseries in the City, and provides free/funded Nursery places for 3 & 4 year olds up to 15 hours a week. Originally, it had capacity for 80 children but when the DCC federated it with St Chad’s school, and then shared a Head Teacher, it was re-designated with a capacity of 52 children. For the last few years, the Nursery has been about 50% occupied. It has a high level (40%+) of children with Special Educational Needs and it is well respected as a school that provides an excellent environment for all children. Although Castle Nursery is within the Arboretum ward it is a City Centre Nursery ( currently 2/3 of the children that attend are from outside the Arboretum Ward) with parents using it from across the city: many parents work in the City Centre/Pride Park. So given this, why is the DCC closing the Nursery? DCC’s reason for closure is simply “Value of Money”. This has been defined by the crude measure of the cost per pupil in the Nursery. The cost figure used in the calculation is the standard, fixed grant given to all Nurseries of £100,000, regardless of size, divided by the number of pupils actually attending. The lowest cost/pupil that Castle Nursery could ever achieve is ~£2000 per pupil with a maximum capacity of 52 children. The DCC benchmark quoted in the Cabinet papers against which Castle is being judged is £1000 per pupil (based on the Nurseries with larger capacities) – a target which is fundamentally unachievable by Castle as a result of the DCC imposed constraints. Phil Crathorne , the Chair of the Governors of St Chads/Castle confirmed that prior to DCC’s report on 19th November 2014 “Consultation on the Future Viability of Castle Nursery School”, that DCC had never discussed with him the notion of a cost/pupil measure or that if a target of £1000/pupil wasn’t achieved that the Council would close the Nursery. This Value for Money measure seems to have been manufactured for the purposes of this closure proposal. The DCC also asserts that due to the low occupancy level, the Nursery’s annual budget is in deficit – this is refuted by Phil Crathorne. The deficit that the DCC reports is ~£3000 on a total budget of ~£200,000 – a 1.5% difference. Is this really significant enough to warrant the closure of an Outstanding Nursery? Is there really nothing that could be done to bridge this small gap? The plan is that any children in the Nursery, or those who would plan to use the Nursery , would be re-directed to other Nurseries in the heart of Normanton/Arboretum. An option that would be less convenient for parents working in the City Centre area, and potentially not an enhancement in the quality of provision. The 8 teaching/non-teaching staff, who are highly skilled, and very well respected have already been served notice of redundancy. Reports so far are that some are being re-deployed as cleaners. No other options to closure were proposed or considered by the Council. If the Nursery is so good, why is it under utilised? The responsibility for “marketing” the school, and ensuring that the maximum number of children take-up their legal right for free school places rests with the Board of Governors ( of St Chad’s school) and the DCC. The Nursery is stand-alone, and located in the middle of an industrial estate and so is not naturally visible to “passing trade”. The combined efforts of the Governors of St Chads ( who have their own nursery), and the DCC, in promoting and making the Castle Nursery visible have been totally ineffective which has resulted in low occupancy levels. The local wards are notorious for low uptake which implies that opportunities exist. The added attraction of being a City Centre Nursery means that it can draw on a large population – this opportunity has not been exploited by the DCC. With a lot of part-time effort from a number of dedicated people in the Friends of the Castle Nursery group ( established since the closure proposal was declared in November 2014) , they have generated a significant amount of interest in the Nursery, including people who have signed up to attend. If this was done in a more structured and sustained way with the resources and influence of the Governors and DCC then it would be not be difficult to see how the Nursery could be fully occupied for the long term. So are there too many places in the City? “The Market Position Statement evidences there is a range of childcare provision available within Derby that currently delivers 2, 3 and 4 year old Free Early Education Entitlement (FEEE) places. It has supported the identification of priority areas that the Local Authority must focus on to support sufficiency gaps identified in key geographical areas to meet the statutory duties defined by the Childcare Act 2006. The Council has a legal statutory duty to ensure sufficient school places for teaching and learning. This includes planning schools places in response to changes in the population and economic migration. This results in the need to plan for new schools and responding to proposed major housing developments for 33,000 dwellings in and around Derby. Thus confirming that their ability to forecast can be improved and which suggests that a level of prudence should be exercised, especially in an expanding and changing market. The case is clearly NOT strong. No analysis has confirmed that the alternative is MORE accessible and MORE convenient and that there will be NO loss of expertise, and specialism. The first sign of a closure proposal was at the Council Cabinet on 19 November 2014. DCC conducted a consultation over a 6 week period from 26 November 2014 to 12 January 2015. Needless to say the majority of this time will have been lost due to Christmas holiday and other festive commitments during this period. Around the 19 November the parents, ex-parents, future parents, and other concerned individuals formed a group called the “Friends of the Castle Nursery”. Since then they have been actively lobbying for support, and gained much publicity for the cause. Curiously their efforts have been met with unexpected resistance from people who should have been supportive. The consultation received a petition signed by nearly 2000 people, plus 63 other direct responses, all calling for the Nursery to remain open. There were no respondents calling for it to be closed. There is no evidence that they listened to any of the feedback, or made any attempt to address the concerns of the parents. It is clear that the Council’s reasoning for closure bears little examination, and their analysis and rigour falls well short of their legal obligations and an independent judicial review is in the process of being initiated. The Queen’s Speech ( and also in the Conservative Party manifesto published in April) declared a policy to increase the number of free hours from 15 hrs a week for 3 and 4 year olds to 30 hrs a week. This will put a significant pressure on existing places and further bring into question the closure proposal. This risk was clear prior to the Cabinet Meeting on 15 April 2015 and the Call-in meeting on 19 May 2015 when the election results were known. The opportunity existed to defer the decision, pending clarity on the Central Government proposals. and where the low occupancy levels could be solved with modest effort is sheer folly! engage with the Friends of the Castle Nursery who are totally committed to the future of this Nursery, and its transition to the new building on the Castle Ward development. agree a formal plan over at least an 18 month period which obliges all parties to act with the common goal of making the Nursery a success. If after 18 months it is still at low occupancy levels and has not fulfilled the plan, then review the future of the Nursery. This is the time for common sense to prevail, to have a focus on the needs of the children in this City, and not for short-term financial expedience. The decision should be reversed as a matter of urgency so continuity can be maintained for the children at Castle Nursery, and a constructive and positive plan implemented. Thank you for your e-mail and a copy of the proposed article in relation to Castle Nursery School. This is noted. As outlined in your document, following careful consideration, Council Cabinet took the difficult decision to close Castle Nursery School in view of future viability due to low pupil numbers. This decision has also been considered by the Council’s Overview and Scrutiny Commission. Thank you for the invitation for a meeting. However, following the decision by Council Cabinet, the Council is progressing with the closure of Castle Nursery School, by supporting parents to find alternative provision, and also carefully supporting staff. “An excellent outstanding Nursery. I would like to thank the teachers at the school whom have helped my son Dawud become a confident person. The school teachers all have moulded him into an excellent well behaved and understanding boy whom wasn’t fully potty trained to becoming a confident boy. His speech was very limited as he hadn’t been able to grasp the sounds, now he has progressed and talks much better. He’s a changed boy I wish he could have stayed at castle nursery longer and also that castle nursery could one day also have a nursery and primary school. I would say it’s the best nursery school in the whole of Derbyshire. A very well organized nursery setting with an outstanding achievement in all areas of growth.